This is my monthly State of the Stack post. It is my way to keep track of my review books and to hopefully reduce the stack that I have waiting for me. I take a look at my review commitments on or near the first of the month. Link with Avalalinha's Books (description below) to check out other people's progress. She has just recently started a meme about review books. So, I reduced the size of my review stack slightly this month. I read 23 and only added 17. I have 19 from NetGalley, 16 from Edelweiss and 7 from Macmillan currently on my stack. Five of the books on my NetGalley stack have been on my Kindle more than three months which isn't too surprising since I read books in order of publication date rather than in order of the date I received them. I have been working away at my May releases but still have 7 to go. Then there are 14 June releases and 11 July releases currently on my stack. I am well ahead reading, writing reviews, and scheduling posts. My April calendar is already complete and I have begun reading books that will be posted in May. I am also linking up with the State of the ARC meme. Here is the explanation and rules. 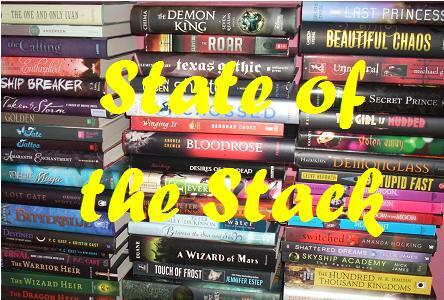 State of the ARC is a monthly meme at Avalinah’s Books meant to motivate you to finish up all your long overdue ARCs (Advanced or Early Reader Copies). You can track your reading progress and link up with your own post. Most commonly it comes out on the 30th of every month. Mention that you’re linking up with State of the ARC @ AvalinahsBooks, which is a fun way to share our ARC progress, challenges, wins, woes and mishaps. Include the link to this post, or the current State of the ARC post. You can use my State of the ARC image too. Don’t forget to visit all the other people in the link-up and comment. Sounds good :) hope you can stay on track in April! You are so much more organized than I am - I love it! Good luck with your schedule and getting through all the books you need to read/review! Those are a lot of books and I love how organized you are. Wow! You read so many. Great work and hopefully this month is going well for you too!